My best friend is currently on a vegetarian diet, and what timing, just when I needed somebody to try this whole new world of eating vegetables I instantly had an eating companion. We’d meet up for lunch and try the cafes close to her office but sadly, either the restaurant served up fried greens with ketchup or the dishes were just made up of mock meat. There was another incident I ordered a salad from a vegetarian menu only to find a generous piece of prosciutto on top of it (I was taught to finish everything on my plate, so I ate it up). These don’t exactly sound like the best or healthiest dining options to me so I had to look for places that served vegetables in its freshest state. After a few inquiries here and there, I found myself in RawVolution. I didn’t know much about Raw Cooking except that some vegetables are at most dehydrated to a certain temperature to keep its nutrients. Just the thought of not having to “cook” already ignited my appetite and see what creative dishes this place can come up with. Raw Asian Rolls. 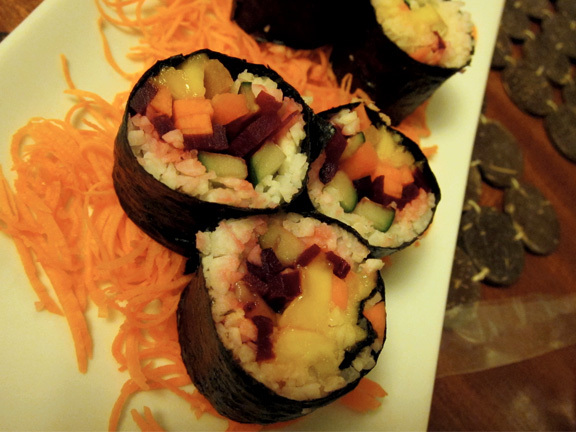 Beets, carrots, mango and cucumber wrapped in nori. With the “rice” portrayed by chipped singkamas (jicama). Since my best friend couldn’t make it, Anonymous Paul and I went together so we can share some dishes. We ordered the Pad Thai, the Asian Rolls and the Mushroom Steak. The Asian rolls were a treat. Crisp veggies rolled up in nori and dipped in soy sauce and a hint of fresh wasabi, it had no trace of meat and yet it was close to eating sushi. The Pad Thai was a surprise. 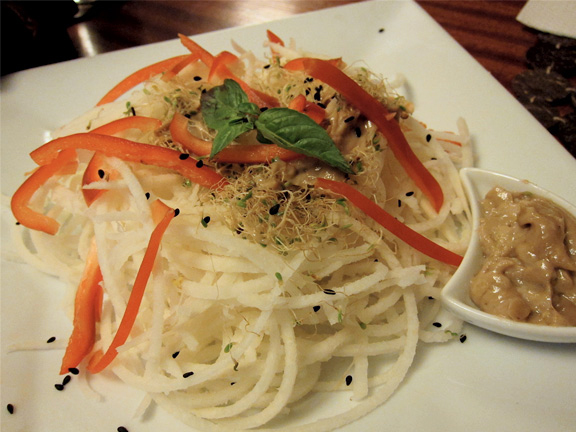 The noodles were long strands of jicama (singkamas) and topped with red bell peppers and alfalfa sprouts. The dish comes with peanut sauce to mix into the dish and the crunch from the jiacama went extremely well with the sauce’s nuttiness. The mushroom steak. The raw mashed potato takes some getting used to. The Mushroom Steak was also delicious, 3 pieces of fresh shiitake mushrooms on a bed of salad and a side of garlic mashed potatoes. Mushrooms never fail me in terms of taste and this dish tasted even better by the 3 sauces that came with it… One of which appeared to be made of beets, one a fresh pesto and another that reminded me of marmalade. It took a little while to get used to the garlic mash since the garlic flavor was pungent and the potatoes were a bit bland and crunchy. 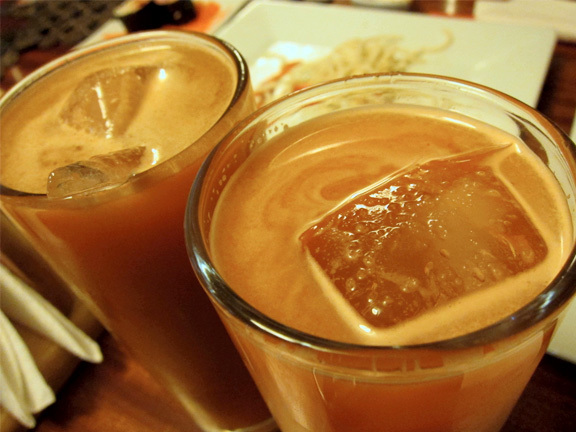 Detoxifying fruit and vegetable juice combos. The verdict? The dishes were creative and very refreshing, Anonymous Paul and I enjoyed our meal but a little shocked at our total bill. However I’d rather pay more for a healthy meal versus paying an expensive visit to the doctor for getting sick. 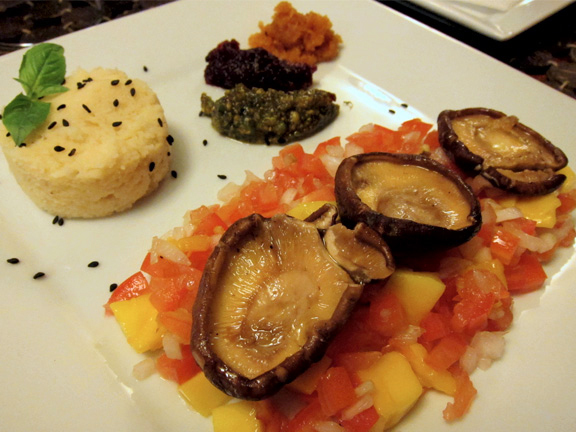 RawVolution offers cooking classes every Saturday for those who may wish to learn more about raw cuisine. Went back a couple of times and it averaged between P600 to P800 per person.